Supporting Strategy develops the concept of the strategic development process. The book begins by describing a balanced process for strategy development, spanning direction setting, strategy creation, rehearsal, evaluation and choice, leading to a continuous process of adopting strategic initiatives. It then goes on to present a practical collection of frameworks, methods and models which both individually and in combination can be used to support strategy. The collection includes: drama theory, visioning methods, problem structuring methods, resource based view of strategy, SWOT / TOWS analysis, system dynamics, agent based modelling, scenario planning, decision and risk analysis, financial evaluation, real options, robustness analysis and performance measurement. This is a contributed work with original content written fro the book from leading academics in the field, including Maureen Meadows, Robert Berry, Jim Bryant, Adrian Caldart, Alberto Franco, Giles Hindle, Nigel Howard, Martin Kunc, Abhijit Mandal, Gilberto Montibeller, John Morecroft, Martin Murtland, Fernando Oliveira, and Efstathios Tapinos. Frances O’Brien is a lecturer in Operational Research at Warwick Business School. (BSc Surrey, MSc Southampton.) She has previously been an Operational Research analyst at Ford Motor Company. Robert Dyson is Professor of Operational Research and Systems at Warwick Business School. BSc Liverpool, PhD Lancaster) He joined the business school in 1970 and became Chairman in 1978-1981 and Dean in 1998-2000. He has also been the Pro-Vice chancellor of the University between 1989-1995 and 1999-2005. He held the Chair, Committee of Professors of Operational Research between 1995-1997 and was the President of the Operational Research Society 1998/9. He is also a member of the British Academy of Management and INFORMS. Spans literature from the fields of Strategy and Management Science / Operational Research. 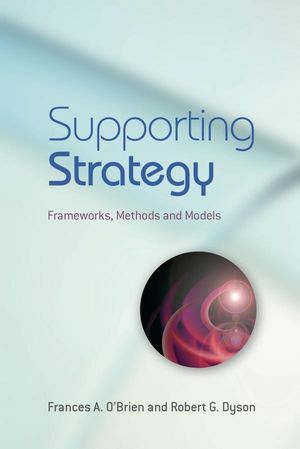 Brings together a novel collection of strategy support frameworks methods and models. Provides a balance between strategy formulation and strategy evaluation. Highlights the role and importance of strategy rehearsal. Each chapter will focus on a particular method and provides an introduction to the method and its role in supporting strategic development, an example of how to execute the method, a case study of the method in practice, and a review of past and future developments.